Melissa (Powar) Clarke advises global clients large and small on employment law and benefits best practices. 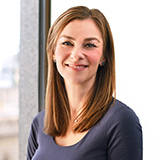 In addition to helping clients comply with municipal, state and federal regulations, Melissa focuses upon managing compensation and equity issues, litigation avoidance, day-to-day employee relations issues and severance and separation matters. She has developed and delivered hundreds of training modules to clients, including courses in benefits administration, anti-harassment, documenting employee issues, wage and hour compliance, and management basics. Melissa also has extensive experience preparing companies for financing rounds, mergers and acquisitions, and initial public offerings. In addition to her employment law counseling work, Melissa represents clients in a variety of litigation matters, including claims of discrimination, harassment, wrongful termination, retaliation, disability accommodation, wage and hour violations, benefits administration and claims pertaining to trade secrets and confidential information. Before joining Payne & Fears, Melissa helped spearhead Seyfarth Shaw's emerging companies group in the firm's Boston office. She was General Counsel for iDrive.com, and began her legal career at Silicon Valley's Gunderson, Dettmer, working with hundreds of emerging and public companies in managing their human capital. Melissa devotes much of her time to community activities, including serving as President of the Amherst Alumni Association of Northern California, serving on the San Francisco Ballet’s Auxiliary, and representing a variety of non-profits, including Breast Cancer Connections, in pro bono matters.